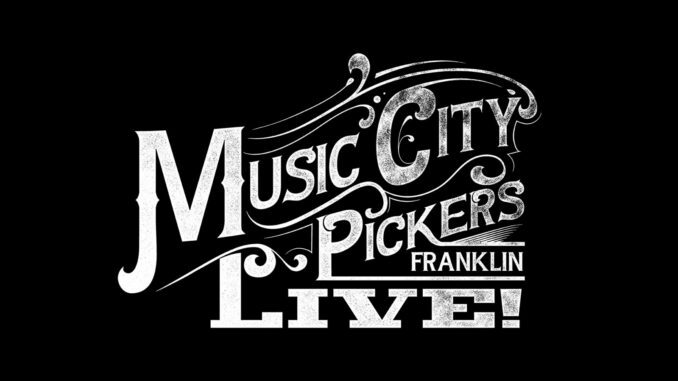 Music City Pickers Live is a new series that will be presenting concerts weekly at The Little Brick Theater at The Factory in Franklin, Tennessee starting December 01, 2016. Their inaugural concert starring Ricky Skaggs was held November 3, 2016. Every Thursday night Music City Pickers will feature up-and-coming talent and hit-makers in two live shows, one running from 6-7:30 p.m., then another from 8:30-10 p.m. The recently renovated Little Brick Theater has fine acoustics. It is an intimate space ideal for listening to the songs and stories behind the music. The series is the love child of longtime friends Brady Seals and Gordon Kennedy. Brady runs a music store in Franklin which has a space for songwriters to hang out. One day Kennedy was working there when the two started talking that it would great to host live performances. Since there was not enough space in Seal’s shop they started looking locally and within a short time it all came together to present the singer/songwriter showcase at The Little Brick Theater. The space is ideal since The Factory has free parking and Saffire restaurant is right in the complex thus creating a perfect night out. Saffire along with Tyler Amp Works, Gibson Custom are among Music City Picker’s sponsors. Volunteers will also be part of this series’ success. Kennedy’s name became nationally recognized when he won Song of the Year at the 1997 Grammy Awards for Eric Clapton’s “Change the World”. Kennedy has written hits for Don Henley, Bonnie Raitt, Garth Brooks, Trisha Yearwood, Bruce Hornsby, Carrie Underwood, Faith Hill, Tim McGraw, Alison Krauss, Nickel Creek, Peter Frampton, George Strait, Martina McBride, Joan Osborne, Wynonna, Jerry Reed and bluegrass legend, Ricky Skaggs. Some of his most notable cuts include Bonnie Raitt singles, “I Can’t Help You Now,” “I Will Not Be Broken” and her title cut “Gypsy in Me”. He is also known for Alison Krauss’ “Maybe,” and his Garth Brooks single, “You Move Me.” Kennedy currently tours as the guitarist for rock legend Peter Frampton. Thursday night Brady and Gordon were hosts as well as performers. During the early set Larry Stewart joined them. Larry is best known as the lead singer of the country pop band Restless Heart. In 1993, Stewart left the group to pursue a solo career resulting in four albums and charting eight singles on the Billboard Hot Country Singles & Tracks (now Hot Country Songs). Larry returned to Restless Heart in 2002. The trio all armed with acoustic guitars took turns presenting music. Brady started with “Hillbillies” a descriptive tune of farm life. Gordon added guitar accents to the tale. Larry presented the catchy “That Rock Won’t Roll”. Gordon talked about some of his early influences before playing Roger Miller’s “Dang Me”. The circle of music continued through a number of rounds with each player sharing stories about the songs they were performing. Kennedy mentioned that he has been asked numerous times to write for movies but the film industry is fickle so not all his songs were used but “Blue Beyond” performed by Trisha Yearwood made it on the Fox and The Hound 2 soundtrack. Other highlights of the concert included Brady’s “God Bless Texas”, Larry’s “I’ll Still Be Loving You” and Gordon’s “Change The World”. Brady Seals and Gordon Kennedy launch new series with guest Larry Stewart (center). As good as the early show was the second set featuring Ricky Skaggs was even better. 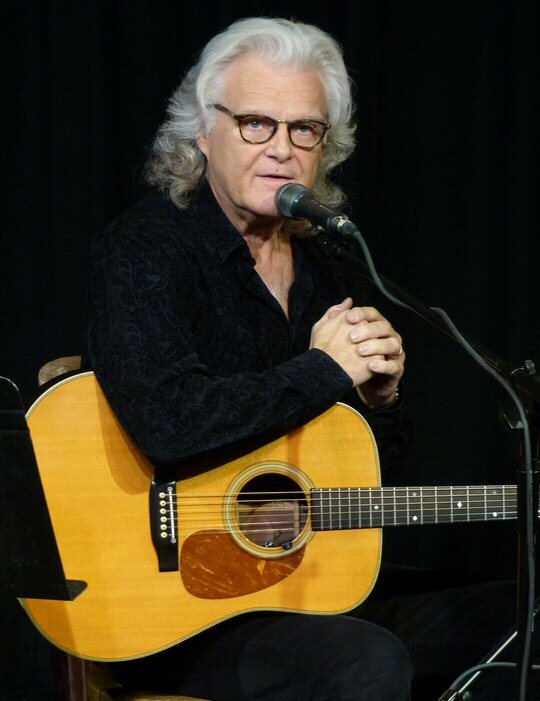 Ricky Skaggs is an American country and bluegrass singer, musician, producer, and composer. Ricky primarily plays mandolin; however, he also plays fiddle, guitar, mandocaster and banjo. His countless awards includes 14 Grammys, 11 IBMA Awards, nine ACM Awards, eight CMAs and two Doves. Recently Skaggs was inducted into the Musicians Hall of Fame in Nashville and given a Lifetime Achievement Award from the AMA. The night before Ricky played at the CMAs which was seen by millions yet Skaggs seemed just as pleased to be performing at the more intimate Music City Pickers event. Brady and Gordon opened the second show briefly describing their vision for the series. Each played a number of popular songs including “Summer Breeze (Seals & Croft) and “Change The World”. Gordon warmly introduced Ricky mentioning Skaggs many accolades. Kennedy declared that he was a fan but also grateful to be able to call Skaggs a friend. Ricky in turn said Gordon was a blessing. Kennedy stayed on stage to accompany Ricky during Skaggs’ inspiring set. 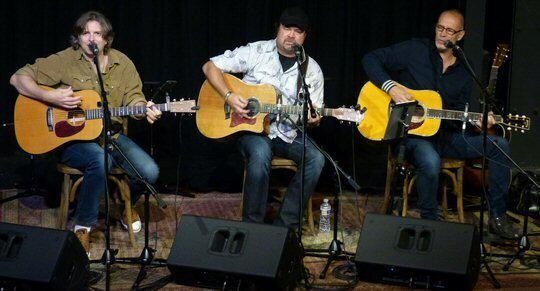 Much of the music they performed was from Mosaic and the forthcoming Mosaic 2 albums. “More awards means more glory for the Lord,” said Ricky. Skaggs shared that “You Can’t Shake Jesus” is one of his most requested songs. It was a powerful piece spiked with pretty picking. Ricky played guitar and his mandolin Pee Wee throughout the night. Skaggs described the instrument as an old, old man who has had a tough life. Pee Wee at one point had ended up in the garbage but thankfully someone had fished him out. Pee Wee has been fully restored and is ready for another 80 years. Skaggs shared another story before going into the comical bluegrassy “You Can’t Hurt Ham”. Ricky talked about God, growing up in the mountains and his musical influences. “Return To Sender” was another moving moment from the Mosaic album. Ricky invited his wife of 35 years Sharon White to sing “When I’m Good and Gone”. Their voices blended beautifully on this faith based song. Towards the end of his set Ricky talked about Elijah standing up bolding for the Lord at a time when Israel had drifted away from God. Ricky expressed his concern that America is now in a similar place and there may come a day when the Lord says enough is enough. “Fire From The Sky” was for the prophet while “Say a Prayer” was a somber warning to individuals and nations. The encore was a more cheerful guitar exchange between Ricky and Gordon. Music City Pickers inaugural concert with Ricky Skaggs was a success. Brady and Gordon along with friends, colleagues and co-writers are excited to offer a place where songwriters, artists and instrumentalists can share their talent with the community of Franklin and beyond. Check out Music City Pickers for a full list of shows starting Thursday, December 1st, 2016.